It is truly amazing to realize that this amount of smokeless powder would more than fill two large feed-sacks and that it is burned at such a rate that it all would be consumed in one minute inside a steel cylinder which weighs only about 50 pounds and is less than one foot long. The rate at which thermal energy is released in firing a weapon of this type is tremendous, particularly when the relatively small physical dimensions of the cylinder arc taken into account. cooling system used for the cylinder will be the major factor affecting the ability of the gun to deliver a high volume of fire. Figure 4-12. Effect of Space Required for Piston Seals. heat to cause its temperature to rise quite rapidly. F.ven with bursts of moderate length fired at intervals, the heat will be retained in the cylinder between bursts and can build the temperature up to the danger point in a relatively short period of time. When the temperature, of the cylinder reaches a level of from 600° to 300° F., it is possible for a "cook-ofT1 to occur. 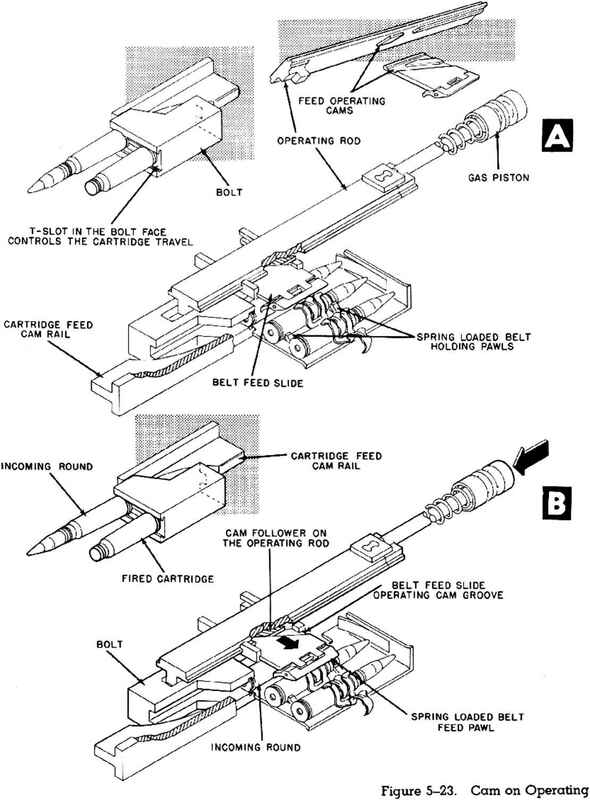 This condition is particularly dangerous in a rotary action weapon because of the fact that the gun may stop firing with live cartridges in chambers which are not aligned with the barrel. If these cartridges should cook off, the results would be disastrous.